Today I will show you what is the perfect Winter outfit for a day to night glamour for petite body shapes. This top will make your bust appear bigger and your stomach flatter. These skinny Parisian jeans will elongate your legs and compliment your curves. This blazer is good to cover up if you have so-called 'bingo wings' . These black Chelsea boots will also elongate your pins and will give you the chic look. A clutch bag is essential for you to store your phone, camera or/and money, and also makes your outfit more elegant. Big drop earrings like those make your face look slimmer, especially if you have short hair. 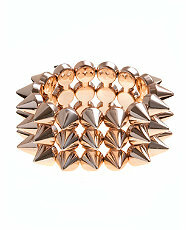 Studs are very rock chic this Winter, so the more the better! There's nothing better than showing some love and peace this season. 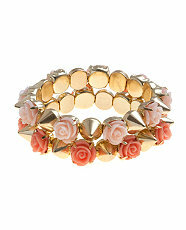 Flowers will give you the instant girly look. The more bracelets the better your outfit looks. Thick eye-liner flicks will give you the catwalk look and instantly glam up your whole outfit.